It's been feeling like spring here in Boston, and I couldn't be happier. Although we've barely had a winter, I am so ready for the warm weather. 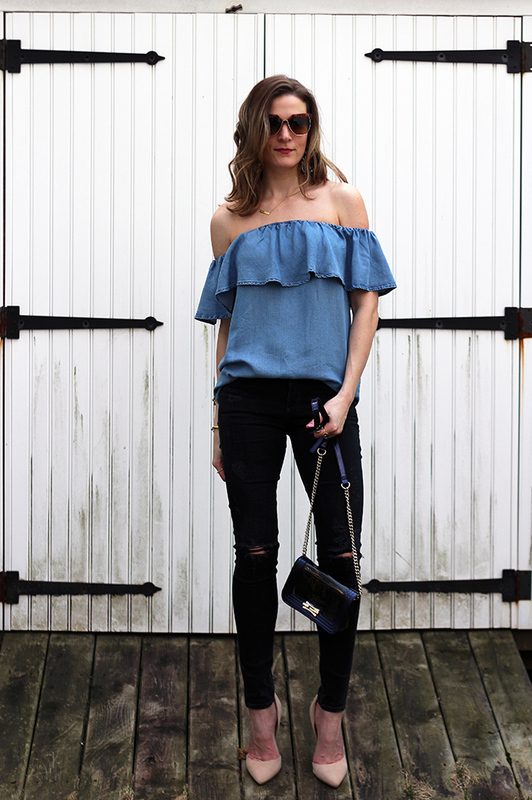 With temps in the 70's this past Wednesday, I couldn't help but to wear an off the shoulder top. There is nothing I love more than baring my shoulders, and I apologize in advance for all the shoulder baring tops and dresses that you'll see on the blog in the months to come. The chambray that I am wearing is actually a dress, but since it's a tad on the short side, I paired it with jeans giving it a shirt-like feel. 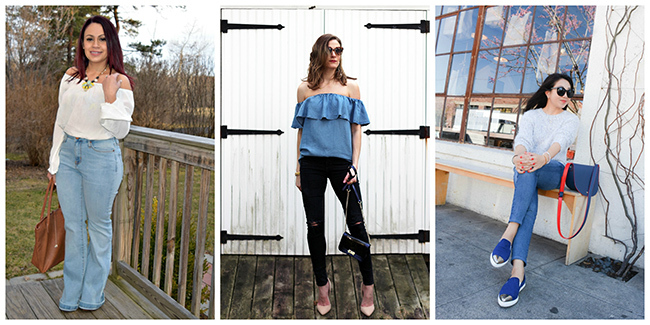 I love how pairing it with black jeans and pumps gave me a perfect transitional look. I also can't wait to pair this dress with denim shorts, or wear it as a beach cover up this summer! I bought this off the shoulder chambray dress earlier this week from Forever 21, and there was a good amount of stock in the Boston area store. However, I searched high a low on the website to link this dress, and couldn't find it! I'm not sure why it isn't available online, but make sure to check your local store. I did find that this dress also comes in a pretty yellow and a striped print, which I linked below. Mason wanted another appearance on the blog, and photobombed me! Ha #momlife. 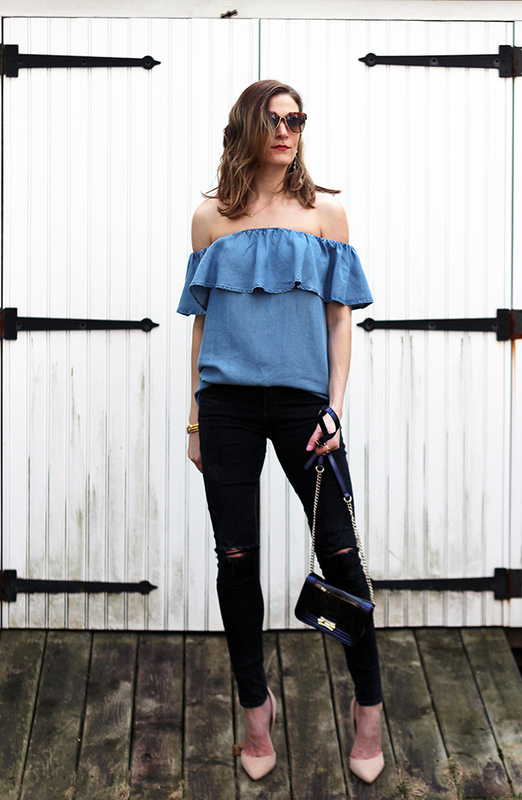 Great off-the-shoulder top! You styled it perfectly! 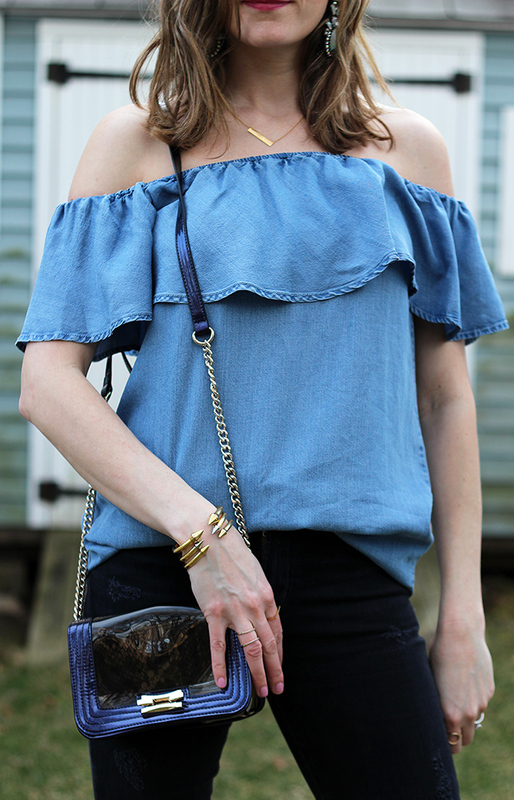 Love this top on you, the off-the-shoulder look is so fun for spring! 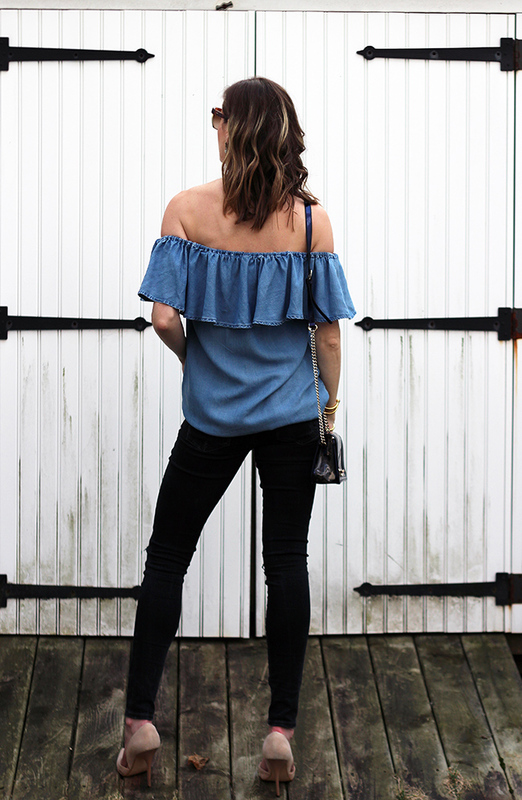 I LOVE off-the-shoulder everything and this chambray is so cute! Perfect for spring! Love how you styled this dress/top with denim! Happy weekend love! Love the off the shoulder!! 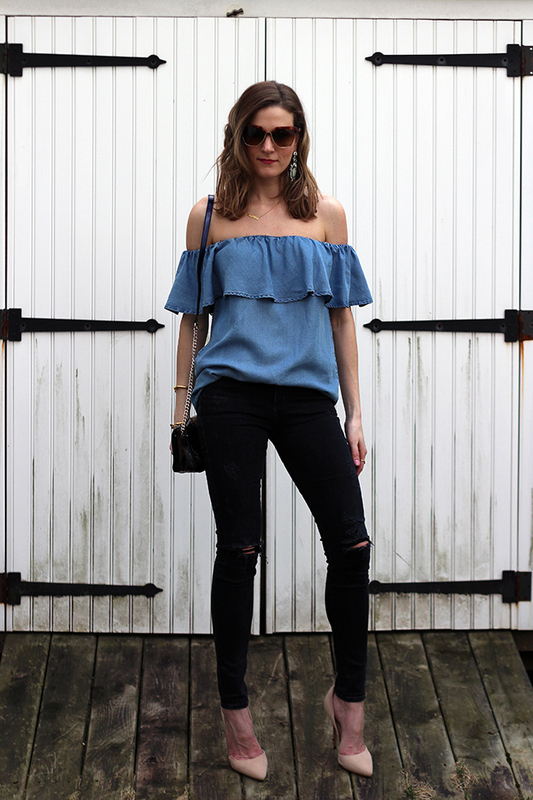 Love the chambray off the shoulder with your darker denim!! Oh, Rachael, that top is tops! I love off the shoulder and peekaboo shoulder tops and dresses. Just love them. That is so cute that your little guy photo bombed you. It looks like something right out of a magazine. Too cute! Have a great weekend! You look ready for the part. 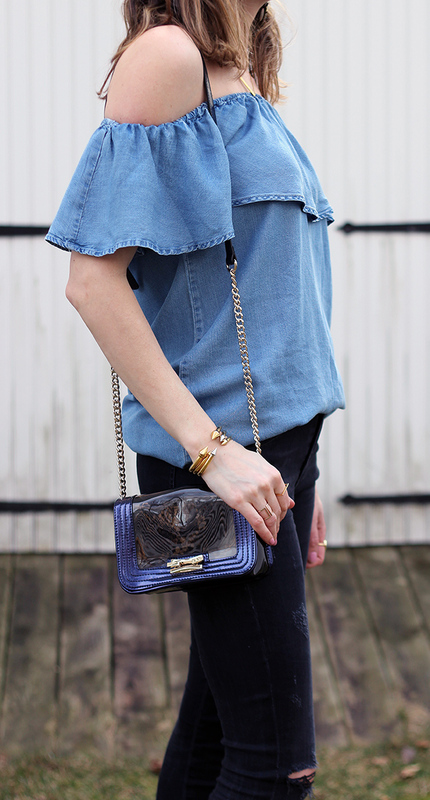 Loving the denim on denim look... so feminine! This top is amazing on you!! I must say Rachel this is one of my favorite looks on you, that top is amazing. You look so pretty in this top. We've also been having some warm weather, and it's amazing! I love this top. 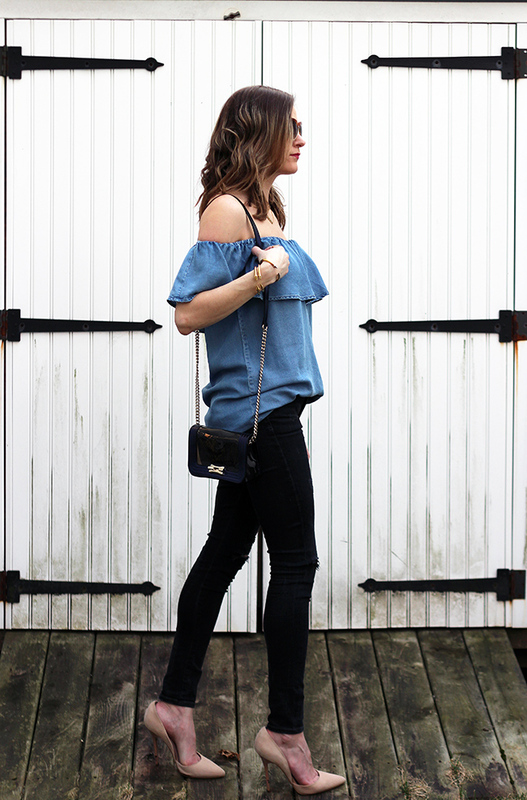 The chambray + off the shoulder is such a great combination. Way to turn that dress into a top! I like it tucked in to your jeans - so cute! That top is gorgeous. I love it. OK I hope to find this off-shoulder chambray dress at my local F21. I want the yellow version too. Your styling is perfect, minimalistic and modern - what you do best. Great distressed skinnies and I love that bag. I am wearing some new distressed skinnies today myself and I also went for a head-to-toe monochrome look!